Grand, fully-furnished and renovated two bedroom apartment with fantastic views over the dunes and the city. 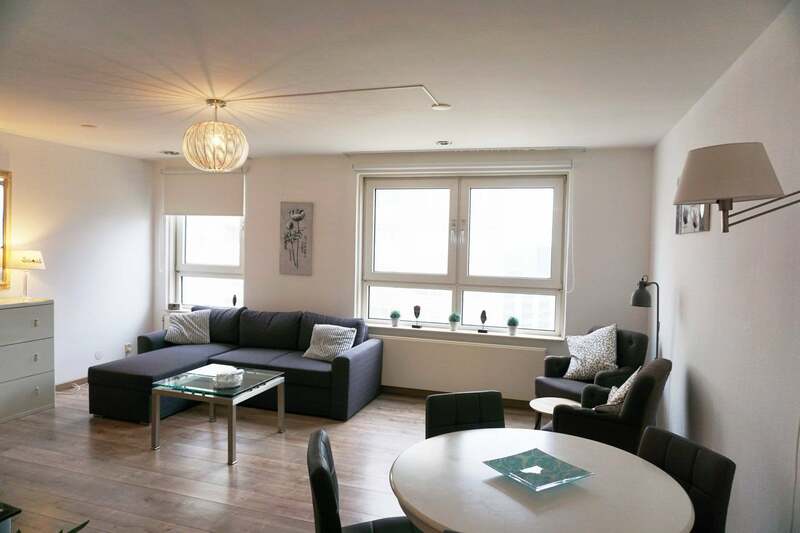 Great property within the heart of Scheveningen. Be within walking distance of all it has to offer. Main entrance of the complex on ground floor, with doorbells, mailboxes and electronic door openers. Two elevators taking you to the seventh floor of the building. As you enter the apartment, you are within a long hall which grants you access to all rooms. Walking straight through you are within the open living and dining room space with panoramic views. The kitchen is open and has all the desired for built-in appliances. A separate pantry is available with washing machine and dryer and plenty of storage space. There are two bedrooms available. The main having a double bed placed within and a large wardrobe. From here you can overlook the dunes and you are nicely secured from the sea wind to enjoy the morning and afternoon sun. The second is slightly smaller and holds a single bed and wardrobe. The bathroom is accessible from the hall and has a modern corner shower and sink. Toilet with sink is separate and accessible from the hall. On the left of the main corridor there is a common terrace overlooking the sea. It is hardly used and next to this apartment. Enjoy it when the sun is out. Full sea view! Private parking space is available for € 150 per month. Email us or give us a call to plan a viewing. Must see apartment!